President Hatch and I are delighted to report that, after an extensive national search, Wake Forest’s Presidential Endowed Professor of Southern History Michele Gillespie has been named the new Dean of the College. 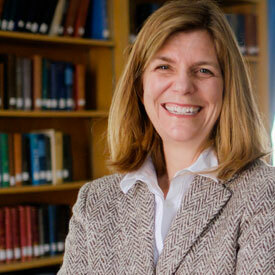 She will officially assume leadership of the College on July 1. I am immensely grateful to my search-committee colleagues who provided valuable insights throughout this process. Dr. Gillespie joined the Wake Forest faculty in 1999. She was named Kahle Family Professor of History in 2003 and served as associate provost for academic initiatives from 2007-2010. In 2013, she was the first Wake Forest faculty member to be honored with an endowed Presidential Chair, which recognizes and supports faculty who excel in both academic leadership and outstanding scholarship. She also currently serves as the faculty representative to the Advancement Committee of our Board of Trustees and is a member of the University Senate. A noted teacher, scholar, historian and author, Dr. Gillespie balances academic rigor with integrating community engagement into her work and her classes. She teaches courses on the history of the American South, U.S. labor, women’s and gender history, and her research explores constructions of class, race, gender and region in the social and economic history of the American South. Her most recent book, “Katharine and R.J. Reynolds: Partners of Fortune in the Making of the New South,” has received national acclaim. Under her leadership, Wake Forest launched the Institute for Public Engagement, now incorporated into the University’s Pro Humanitate Institute, which builds relationships with community partners and supports publicly engaged teaching, service-learning courses and volunteer opportunities. In 2010, Dr. Gillespie was honored as a pioneer in the national service-learning field with North Carolina’s Robert L. Sigmon Service Learning Award. Our committee, as well as President Hatch, was impressed with Dr. Gillespie as a highly respected professor and faculty member, a first-class scholar, and a dedicated member of the Wake Forest community who understands what makes the Wake Forest experience distinctive and fulfilling for our most important constituents: our students. Please join me in congratulating Dr. Gillespie our new Dean of the College and join us for a reception in her honor in the Reynolda Hall Green Room on March 30 from 2:30-3:30 p.m.